After the possibility of a ’51 percent attack’ recently endured by the Bitcoin community, it’s worth to know more about the mining pools available in the Bitcoin space. 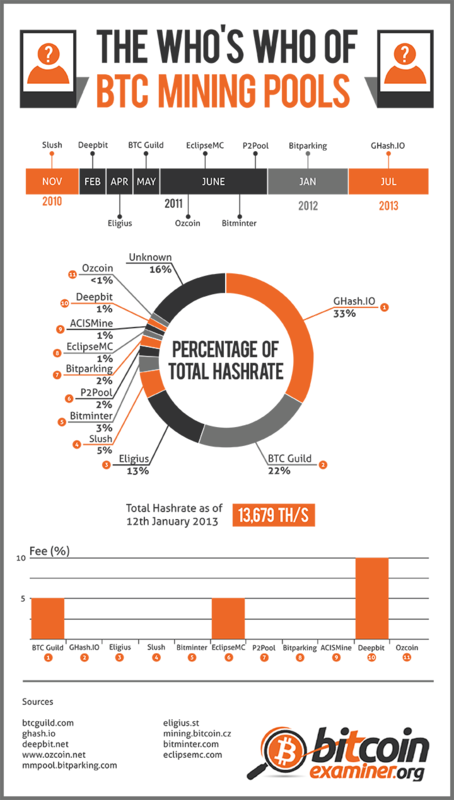 Despite the several miners that left the pool in the meantime, Ghash.io is still the biggest mining group in the ecosystem, with 33 percent of the hashing rate at the time of the creation of this infographic. The number represents a clear decrease in the pool’s mining power after the 42 percent held last week. After the possibility of a ’51 percent attack’ lived by the Bitcoin community during last week, it’s worth to know more about the mining pools available in the Bitcoin space. Ghash.io is still the biggest pool in the ecosystem, with 33 percent of the hashing rate at the time of the creation of this infographic. The number represents a clear decrease in the mining power after the 42 percent conquered last week.